London designer Christopher Jenner has teamed up with British heritage brand Elkington and Co to reimagine everyday pieces of silverware for London Design Festival 2017. 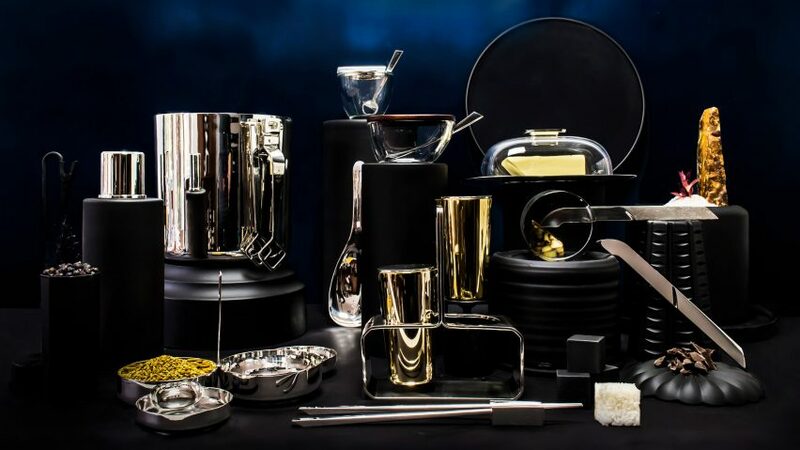 Called Epicurean, the collection comprises 24 pieces and features luxurious iterations of items such as sugar bowls, tea pots and salad servers. The collaboration arose after Jenner became interested in elevating commonplace domestic utensils, focusing on ways they are crafted. The designer turned to Sheffield-based company Elkington and Co, which has practiced silver plating since it was established in 1824, to closely study traditional and modern silversmithing techniques. Jenner then applied this knowledge to his designs, while also making visual references to minimalism and geometric shapes. This can particularly be seen in the collection's spoons, which are made with a squared instead of curved tip, and a simplistic water jug that appears to be moulded from a single piece of metal. Other materials have also been applied throughout Jenner and Elkington's homeware range. Hand-blown crystal forms the cover of a butter dish, while walnut is used for the lid of an ice bucket. For the launch of the collection at this year's London Design Festival, Jenner also called on the help of Studio Appetit, which specialise in culinary design projects. The Dutch studio has devised five food installations that will act as the backdrop to Jenner and Elkington's creations, each one a monochromatic still-life that uses ingredients relevant to particular Epicurean pieces. These installations are on display at the Thomas Goode and Co store, 19 South Audley Street, London W1K 2BN, from 18 to 22 September 2017. Other brands will also display home accessories at the design festival, which takes place citywide from 16 to 24 September 2017. Architecture collective Assemble has made a series of plates with unique paint splatter combinations, while Pulpo has worked with a host of designers to create their Fabulously Awesome Tablescape collection.